1142: Muybridge’s Panorama of San Francisco 1877 Title: Panorama of San Francisco, from California Street Hill Author: Muybridge, Eadweard Description: 11-panel albumen photograph panorama, each image approximately 7 3/4 x 8″, mounted consecutively on archival board with overall measurements of the panorama 7 3/4 x 85″, framed under plexiglass, overall the piece measuring 13 x 89 1/2″. Muybridge’s breathtaking 360 degree panorama from California Street hill, taken, it is believed by scholars, between May 23 and June 23 (due to examination of the shadows), and probably on Monday (people are doing their wash). Probably Muybridge’s most famous single work, providing not only one of the best views of the bustling metropolis, but also a wealth of entertainment upon close examination. This picture tells many stories. Visible in striking detail are the mansions of the rich and the dwellings of the poor, the churches, hotels, banks, and other features. Muybridge also produced a mammoth plate panorama of San Francisco, which is excessively rare, only 5 or 6 copies known to exist. The present, smaller version was issued folding into cloth covers. Provenance: Daniel G. Volkmann, Jr.
Cliff House Project—A site dedicated to Adolph Sutro’s Victorian Cliff House. San Francisco Memories—A visual scrapbook of various events and structures in San Francisco’s history. Calisphere – A collection of images from the University of California. America Hurrah – Images and text on the history of San Francisco and California. Books about California – Books about California, including etexts, and publishers lists. Includes San Francisco publishers and books about the City. San Francisco Bay Area Freeway Development – History of San Francisco Bay Area Freeway Development with maps. California Ephemera Project – Guides to the ephemera collections of California institutions through the Online Archive of California. Critical Mass History – History of the monthly bicylist protest through the streets of the City. Don’t Call it Frisco Test – A quiz of San Francisco knowledge by Bob Tuce. Encyclopedia of San Francisco – A project from the San Francisco Museum & Historical Society. Includes a timeline, gallery, bios, etc. San Francisco Maritime National Historical Park – History of San Francisco Maritime National Historical Park site. Gold Rush Trail – Walk San Francisco’s Gold Rush Trail, an outdoor museum of San Francisco history. The Gold Rush – A collection of links to Gold Rush resources. 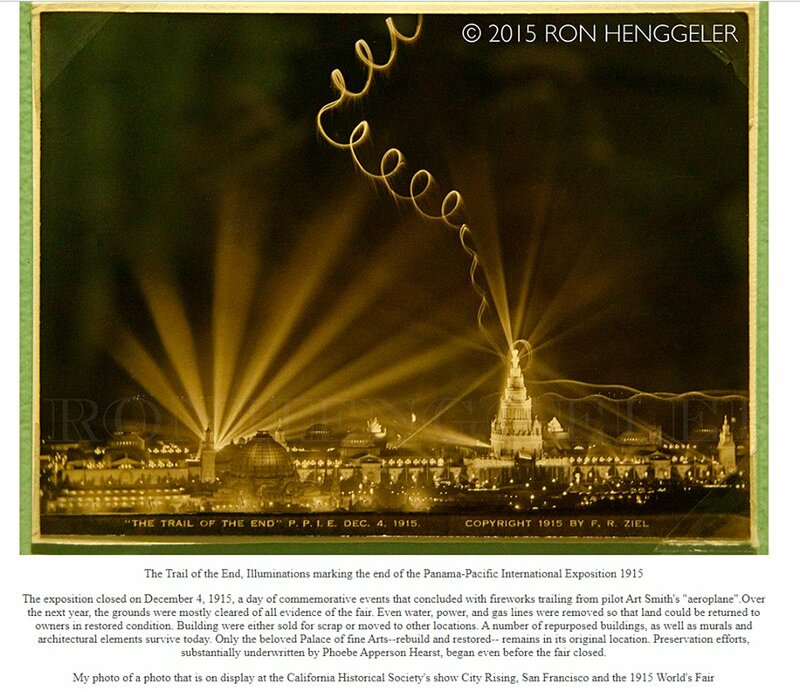 Golden Gate International Exposition 1939-1940 – History of the GGIE held on Treasure Island. Heart of the City – Includes various sections on the City’s cultural history, along with a street origin guide, written by journalist Hank Donat. History of the San Francisco Boy Scouts – History of the SFBAC – Boy Scouts of America – San Francisco Bay Area Council. HistorySmith – The website for Jim Smith’s book, “San Francisco’s Lost Landmarks”, 2005. Hoppers Hands – The story behind infamous Hoppers Hands sign at Fort Point. Horse and Buggy Days in San Francisco – Horse and Buggy Days in San Francisco. Old ads and photos from Larkins and Co., 1865-1913 carriage makers. Iceberg at the Golden Gate – An article about Henry Washington Dodge, a survivor of the Titanic disaster, by Jan C. Nielsen. Jewish Life in San Francisco, 1860 – A passage about Jewish life from “From Three Years in America,” 1862. The Maritime Heritage Project: Gold Rush Ships, Passengers, Captains – A non-profit organization dedicated to preserving shipping history from the mid-1800s to the turn of the Century. Mechanics’ Institute Library – A general interest library in the San Francisco business district, from 1854. 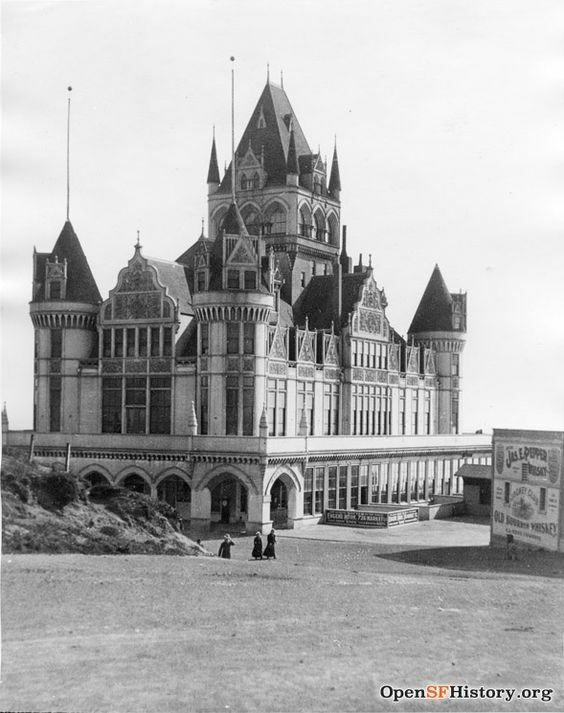 Memories of San Francisco – A site dedicated to San Francisco’s Lost Landmarks, by Jim Smith. Museum of the City of San Francisco – Home page of the Museum of the City of San Francisco, with exhibits and links on practically every aspect of local history. Muwekma Ohlone – Official website of the Muwekma Ohlone Indian Tribe, who were the original inhabitants of the San Francisco Bay Area. Panama Pacific International Exposition 3D – Stereographs hosted by the San Francisco Exploratorium. Pier 70 – History and current condition of the oldest operating civilian shipyard in the United States. Playland Amusement Park – The dark side of the Playland Amusement Park. Polish Community – historic newspaper articles about the Polish community in California. 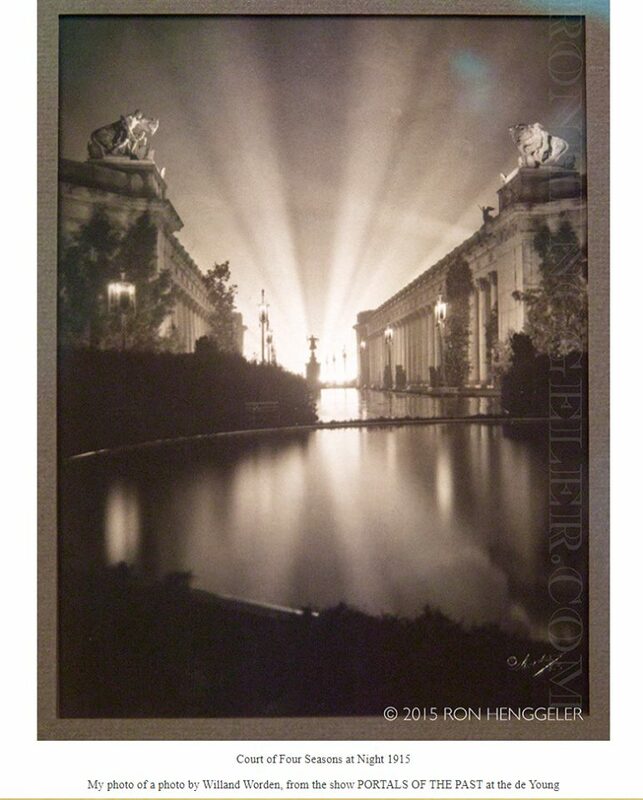 Postcard Exhibits – Exhibits of early postcards including the Cliff House, Golden Gate International Exposition, etc. Pre-Prohibition Businesses – A “repository of information on the distillers and wholesalers who made a living from the liquor industry in the years leading up to Prohibition…” including those in San Francisco. San Francisco Ferryboats – History of the various ferryboats that serve the Bay, including steam engines, paddlewheels, diesels, catamarans, etc. San Francisco History – A collection of historical resources for the City and County of San Francisco, California. 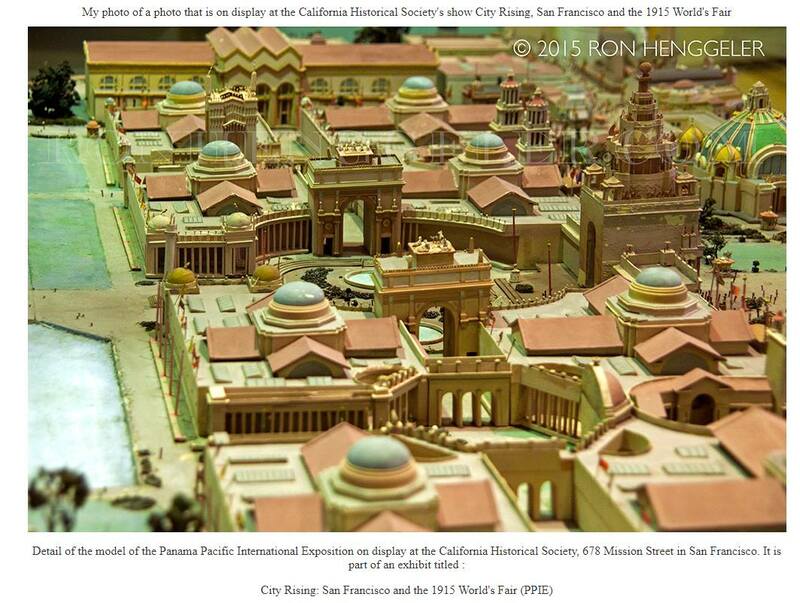 San Francisco History Index – From prehistory to the present. Includes historical maps, neighborhoods, ethnic groups, an email list and forum. San Francisco Memoirs – The history of San Francisco in the words of people who were in the city between 1835 and the earthquake of 1906. San Francisco Memories – A visual scrapbook of various events and structures in San Francisco’s history. Shaping San Francisco home page – Shaping San Francisco pioneers an interactive multimedia approach to San Francisco’s lost history. Sin, Fire and Gold! – KQED’s documentary about San Francisco’s Barbary Coast history, the gold rush, the 1906 earthquake and fire. Slavonic Cultural Center – History of the Slavonic Cultural Center, a center for cultural programs which reflect the diverse artistic traditions of the Balkans’ diverse cultural groups. The Straight on The Haight – Stories and history of the Haight Ashbury. 60’s styles, music, fashions and accessories in picture and text. Summer of Love – A celebration of the 1967 Summer of Love. Summer of Love – The 1967 Summer of Love web site tour. 1906 Earthquake Centennial Alliance – A collection of academic/research groups, universities, societies, museums, corporations, etc. who will be participating in the 1906 centennial. 1906 Earthquake Photo Gallery – Photograph gallery of the 1906 San Francisco earthquake by Western Mining History. 1906 San Francisco Earthquake – Information from Wikipedia, the free encyclopedia. 1906 San Francisco Earthquake – Eyewitness accounts of quake and fires that almost destroyed the city in 1906. 1906 San Francisco Earthquake and Fire – An online exhibit with many pictures presented by the Bancroft Library in Berkeley. The Camera Story of the San Francisco Earthquake – Photographs from the book hosted by Golden Nugget Library. Earthquake Images Database – Images of the 1906 San Francisco Earthquake and Fire by the National Information Service for Earthquake Engineering. Earthquake Walk – Descriptions of buildings, etc. that can be seen from an easy walk; by San Francisco Offbeat. Faultline – An online exhibit by The Exploratorium. Museum of the City of San Francisco: The Great 1906 Earthquake And Fire – Extensive information including photographs and the names of those who perished, earthquake timeline, and Gladys Hansen’s Earthquake Almanac. Quake: 1906 San Francisco Quake – Presented by the U.S. Geological Survey (USGS), Earthquake Hazards Program. Photos Before The 1906 San Francisco Earthquake (from “San Francisco’s Great Disaster-1906 Sampler” by Sydney Tyler) – Hosted by Golden Nugget Library. Photos After The 1906 San Francisco Earthquake (from “San Francisco’s Great Disaster-1906 Sampler” by Sydney Tyler) – Hosted by Golden Nugget Library. Real Shock, Monetary Aftershock: The 1906 San Francisco Earthquake and the Panic of 1907 – Presented by Claremont Colleges Working Papers from Claremont Colleges. San Francisco 1906 Earthquake Marriage Project – Examines the unique phenomenon of marriages occuring immediately after and because of the disaster. San Francisco Films: 1906 Earthquake & Fire – Seven films showing the aftermath of the 1906 earthquake and fire. Presented by American Memory, Library of Congress. San Francisco Earthquake Panoramas – Panoramic images, derived from the American Memory films, showing the aftermath of the 1906 earthquake and fire in San Francisco, California. San Francisco Earthquake Postcards – Various postcards hosted by Golden Nugget Library. San Francisco in Ruins – San Francisco in Ruins: The 1906 Aerial Photographs of George R. Lawrence. Source Study of the 1906 San Francisco Earthquake – A systematic analysis of the recorded teleseismic body and surface waveforms. Story of an Eyewitness – Jack London’s May 1906 article for Collier’s describes his first-hand experiences witnessing the aftermath of the 1906 earthquake. Tsunami from 1906 San Francisco Earthquake – A collection of scientific evidence including maps and graphs, by the USGS. 1989 Oakland Earthquake – Ladder54 photos includes 1989 California Bay Area earthquake collapse of Interstate 880 to I 80 in Oakland. Rescues and recoveries as well. US Geologic Survey: Loma Prieta Earthquake Photos (DDS-29) – Over 100 high-resolution photographs of the October 17, 1989 earthquake, with index map, available in GIF, JPG, PDF, and PCD versions, as well as fact sheet and related links. Alcatraz Island – The National Park Service official site. Alcatraz Island – A brief history of Alcatraz by the Federal Bureau of Prisons. Alcatraz History – History of the prison during the penitentiary years. Escapes from Alcatraz – History of every recorded attempted and successful escape from Alcatraz, while it was an Army prison and Federal penitentiary. Fortress Alcatraz – When Alcatraz was an Army post, a site by John Martini. Photographic Tour – A photographic tour by columbiamaryland.com. Photographic Tour – A photographic tour by virtuar.com. Warden Johnston Years – History, maps, prisoner listing, etc. of the Federal penitentiary. Audiffred Building – The history of the Audiffred Building, built in 1889. Cliff House Project – A site dedicated to Adolph Sutro’s Victorian Cliff House. Fallon Building History – Tim Kelley’s history of San Francisco’s Carmel Fallon Building, survivor of the quakes of 1906 and 1989. Friends of 1800 – The Friends of 1800 is a grassroots, nonprofit organization dedicated to preserving significant historical buildings, landmarks and the architectural heritage of San Francisco. Ghirardelli Square – History of one of the most well known historical landmarks in the City. History of a San Francisco Landmark House – An 1871 home in the Mission district of San Francisco. Details of the area and restoration information. Painted Ladies – the virtual site for the books showing examples of beautiful Victorian architecture. San Francisco Architectural Heritage – An organization dedicated to the appreciation of the built environment and understanding of the value of preserving significant San Francisco architecture. San Francisco Victorian Architecture – Some photographs of eminent Victorian residences in San Francisco. Sutro Tower – History and timeline of the Sutro Tower. The Victorian Alliance of San Francisco – Preserving Victorian Homes – The Victorian Alliance is a non-profit organization committed to the preservation and restoration of Victorian and other historic structures, particularly within the city of San Francisco. Guided by History – A blog “covering local commemorative events” by Wells Fargo. History and Kultur – Podcasts by sparkletack spotlighting various historical items. Up from the Deep (The Hotel Project) – Images from the streets by Mark Ellinger. Market Street Railway – A blog covering the Market Street Railway. San Francisco Film Locations Then and Now – A blog of Then and Now photographs. Books about California – A large collection of public domain etexts and images. Alioto’s Restaurant – founded in 1925 at Fisherman’s Wharf. Anchor Brewing Company – Anchor Brewing dates from 1896. This site has info on the Golden Gate Bridge, Telegraph Hill, Shot Towers, and the brewers of San Francisco. Folgers Coffee History – A brief history of Folgers in San Francisco. Golden Gate Ferry Fleet History – A short history of ferries in the Golden Gate. Grocery Stores – Overview of the local grocery stores in San Francisco from 1920 to 1999. Moulin Studios – A timeline of a local photography studio from 1872. Taxis and San Francisco Labor History – The taxicab industry in San Francisco from 1904. Cable Car Inventor – Andrew Hallidie – 1873 – A biography of the inventor, presented by the Museum of the City of San Francisco. Cable Car Lines in San Francisco – A list of the local cable car lines and references to them in literature and on film. Cable Car Museum – The companion website for the Cable Car Museum; includes general information and a virtual tour. Cable Cars – Dedicated to information and history about San Francisco’s moving landmarks. Early Film: A trip down Market Street before the fire – 1905 B&W film from American Memory; shows street and cable cars. Early Film: Market Street before parade, part 1 – 1903 B&W film from American Memory; shows street and cable cars. Early Film: Market Street before parade, part 2 – 1903 B&W film from American Memory; shows street and cable cars. Rice-A-Roni – A brief history by one of most well-known advertisers for the cable cars. Calvary Presbyterian Church – History of the Calvary Presbyterian Church which was organized in 1854. First Baptist Church of San Francisco – History of First Baptist Church of San Francisco history founded in 1849. First Congregational Church of San Francisco – History of the First Congregational Church of San Francisco from 1849. First Unitarian Universalist Society of San Francisco – A chronology of the First Unitarian Church in San Francisco. Glide Memorial Church – History of the Glide Memorial Church. Grace Cathedral (Episcopal Church) – Tales from the Crypt – the history of the cathedral structure and community. Holy Trinity Cathedral – Brief history and news articles of the Holy Trinity Cathedral founded in 1857. Mission Dolores Catholic Church – More history of the Mission San Francisco de Asis. Old First Presbyterian Church San Francisco – History of the Old First Presbyterian Church San Francisco since 1849. Old Saint Mary’s Past and Present – History of the Old Saint Mary’s Church, built in 1854. Saint Francis of Assisi Church History – A brief history of the National Shrine of Saint Francis of Assisi in North Beach which was established in 1849. San Francisco Central Seventh-day Adventist Church – History of the San Francisco Central Seventh-day Adventist Church from 1871. St. Brigid Church, San Francisco, CA – History of St. Brigid Catholic Church from 1863. St. Cyprian’s Episcopal Church – History of St. Cyprian’s Episcopal Church found in 1923. St. Luke’s Episcopal Church – History of St. Luke’s Episcopal Church founded in 1868. Bay View Boat Club – History of the Bay View Boat Club. Bimbo’s 365 Club – History of a local San Francisco entertainment club. Boys & Girls Clubs of San Francisco – Short history of the Boys & Girls Clubs of San Francisco founded in 1891. The Commonwealth Club of California – History of the nation’s oldest and largest public affairs forum. The Dolphin Club – San Francisco – History of the Dolphin Swimming and Boating Club, established in 1877. Mechanic’s Chess Club – History of the Mechanics’ Institute Chess Club. Norwegian Club Information – Brief history of the Norwegian Club which formed in 1897. San Francisco Motorcycle Club – 99 Years of History, from 1904. San Francisco Tsunami Swim Club – A club composed of San Francisco’s gay and lesbian swimmers. Skating Club of San Francisco – The history of the Skating Club of San Francisco since 1932. Swedish Club of San Francisco and Bay Area – Short history of the Swedish Club formed in 1913. GLBT Historical Society – A group dedicated to gay, lesbian, bisexual, and transgender history. Barbary Coasters, The – A group dedicated to San Francisco’s African-American history. Fort Point and Presidio Historical Association – Historical preservation and education nonprofit association for the Presidio of San Francisco National Historic District, which is a former military post. Membership information and background on pending issues. Market Street Railway – A non-profit support group for the San Francisco Municipal Railway’s historic transit fleet. San Francisco Historical Society – A non-profit organization that preserves, interprets and presents the historical heritage of San Francisco. San Francisco History Association – A non-profit organization dedicated to remembering our San Francisco’s colorful past. Chinese Hospital of San Francisco – A very brief history of the Chinese Hospital from 1900. Saint Francis Memorial Hospital – A timeline from 1905. St. Mary’s Medical Center – Historical timeline of the center from 1854. UCSF Medical Center at Mount Zion – History of the hospital from 1887. UCSF School of Medicine – History of the school from 1848. The Chateau Tivoli – History from 1892. The Fairmont – History from 1902. Hotel Boheme – History from 1880s. Palace Hotel – History from 1875. Palace Hotel – Another site with history from 1875. The Queen Anne Hotel – History from 1890. San Remo Hotel History – History from 1906. Sir Francisco Drake Hotel – History from 1928. St. Francis – History from 1902. American Memory – A collection of digitized documents and images from the Library of Congress, includes many of San Francisco. California Heritage Collection – California Heritage Collection: large collection of San Francisco images from the Bancroft Library. Charles W. Cushman Photograph Collection – A voluminous collection of images by Charles Cushman, from 1938 to 1969. Golden Gate International Exposition Photo Gallery – A photo gallery presented by New Deal Network. Lawrence & Houseworth Photograph Database – Collection of 1,495 historical photographs of California and Nevada from the Society of California Pioneers. Picture History (San Francisco) – Pictures in a digital library of high quality images and footage for American history. Retrofuturo – Has a picture of what San Francisco might look like in the future. SFGov Photo Gallery – Collections presented by the City of San Francisco, including: General San Francisco History, 1906 Quake and Fire, Fire Department History, Chinatown, Contemporary, Bay Bridge, Buildings, Cable Cars, Chinatown, Fisherman’s Wharf, Golden Gate Bridge, Port of San Francisco, Modern Art Museum (MOMA), San Francisco Skyline, and City Hall. San Francisco Historical Photograph Collection – Collection from the San Francisco Public Library, covering San Francisco history from the 1850s to the present. Stereoviews of Carleton Watkins – A large collection of stereoviews created by Carleton Watkins and includes many of San Francisco. J. Paul Leonard Library: Labor Archives & Research Center – Dedicated to the preservation of historical materials of labor activity. California Landmarks – San Francisco County – List of the California State Historical Landmarks in the City, along with photos of some of the plaques. Historic Landmarks – List of local landmarks compiled from national, state and city sources. San Francisco Landmarks – A complete listing of San Francisco landmarks with dates of official landmark designation. San Francisco Landmarks – A “photographic archive of San Francisco’s historic landmarks as they appeared at the beginning of the third millenium.” Presented by Noe Hill. Aerial Photography Online Flights – Includes San Francisco Bay Area in 1968, and San Francisco-Oakland Bay Bridge Approaches in 1931. California Coastal Records Project – Aerial Photographs of the California Coastline, including along San Francisco. California Views – A collection of photographs for California including San Francisco, from the Pat Hathaway Photo Collection. City Views – Many early city views from stereoviews. Digital Atlas of San Francisco Bay Area, 1990 – Maps of population, citizenship, income, poverty, and education. By the American Cities Atlas Project. Early City Views – Eight views: 1837, 1846, 1847, 1849 (2),1850, 1855, and 1856. Historic Topographic Maps of California – Web access to various historic topographic quadrangles produced by the U.S. Geological Survey between 1895 to the present. Historical Map of San Francisco, 1849 – Official map of the city (American Memory collection). Historical Map of San Francisco, 1915 – U.S. Geological Survey map (1,403K) (American Memory collection). Historical Maps of San Francisco, 1850 to 1926 – Maps and aerial photos from the David Rumsey Historical Map Collection. Includes maps for 1851, 1852, 1859, 1861, 1869, 1873, 1874, 1890, 1905, 1915 and 1926. Option available to overlay maps and photos. Historical View of San Francisco, 1846-7 – A color bird’s-eye view of the city (American Memory collection). Historical View of San Francisco, 1856 – A bird’s-eye view of the city (American Memory collection). Historical View of San Francisco, 1862 – A view of the city looking from Russian Hill (American Memory collection). Historical View of San Francisco, 1868 – A color bird’s-eye view of the city (American Memory collection). Historical View of San Francisco, 1896 – A color bird’s-eye view of the city (Golden Nugget Library). Historical View of San Francisco, c. 1851 – A view of the city looking southeast from Telegraph Hill (American Memory collection). Historical View of San Francisco, c. 1860 – A hand-colored bird’s-eye view of the city (American Memory collection). Historical View of San Francisco, c. 1864 – A bird’s-eye view of the city (American Memory collection). Historical View of San Francisco, c. 1875 – A bird’s-eye view of the city (American Memory collection). Historical View of San Francisco, c. 1876 – A bird’s-eye view of the city (American Memory collection). Historical View of San Francisco, c. 1878 – A bird’s-eye view of the city, looking southwest (American Memory collection). Historical View of San Francisco Peninsula, 1851 – Route of the Pacific and Atlantic Rail Road between San Francisco, & San Jose. The Map Room – Maps & Views from 1849, 1916, and 1968. Panama-Pacific International Exposition Map – 1915 – Map of the Panama-Pacific International Exposition grounds. Perry-Castañeda Map Collection – From UT Library, includes 1970 Atlas map, 1901 Milk Map, and 1915 USGS map. Presidio Military Reservation map – 1847 – The military reservation in 1847 as laid out by Captain Folsom. 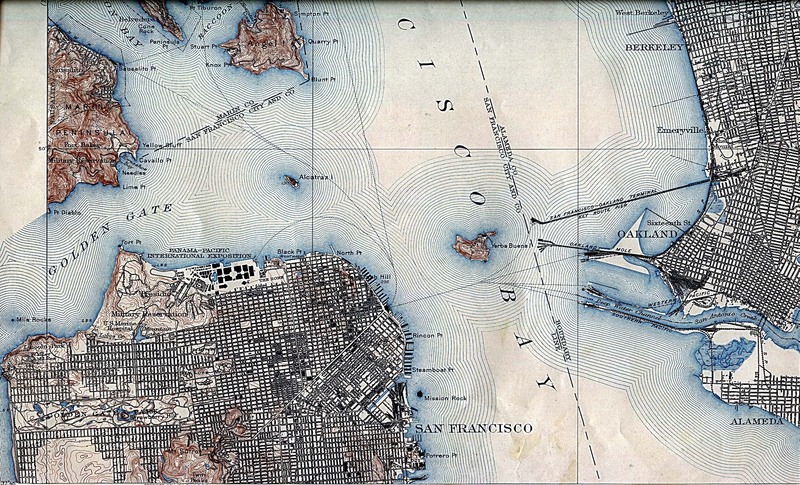 San Francisco Bay History – Various photos, illustrations and maritime charts. San Francisco Bay Map – 1826 – Captain Beechey’s nautical map of the San Francico Bay. San Francisco Bay Map – c. 1776 – Font’s map of the entrance to the San Francisco Bay. San Francisco Bay Map – c. 1777 – Font’s map of explorations, Monterey to San Francisco. San Francisco Bay Map – c. 1792 – Vancouver’s map of the entrance to the San Francisco Bay. San Francisco Bay Map – 1913 – Pictorial map of the Bay Area. San Francisco Fire – May 1851 – Map of the May 1851 San Francisco Fire. San Francisco Map – 1839 – Vioget’s survey of Yerba Buena. San Francisco Midwinter Fair – 1894 – Map of the 1894 San Francisco Midwinter Fair. 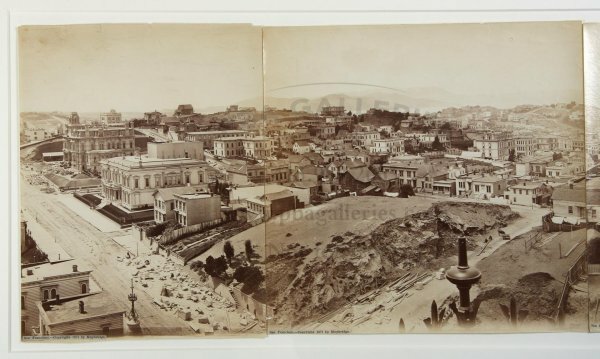 San Francisco Panorama – 1878 – Two panoramic views of the city by Edward Muybridge, by sanfrancisco.cityviews.us. San Francisco Population – Maps showing the Growth of San Francisco from 1853-1970, and ethnic maps from the 1980 census. San Francisco Postcards – Postcards with various views of San Francisco throughout her history, presented by alamedainfo.com. 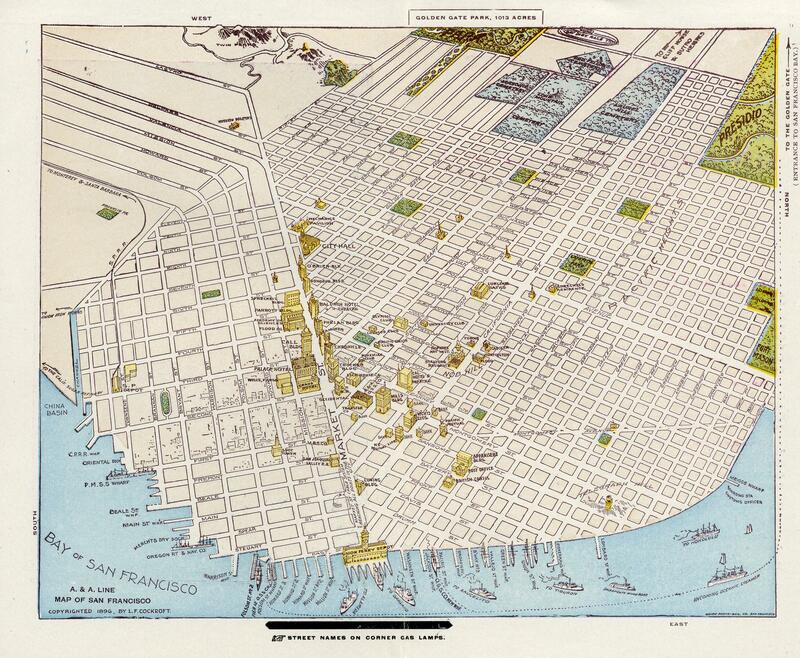 San Francisco Street Map – 1873 – San Francisco 1873 street map. San Francisco Street Map -1907 – San Francisco 1907 street map. San Francisco Street Map – 1925 – San Francisco 1925 street map. Bay Area Radio Museum – A collection of recordings, photographs, etc. reagrding the history of radio broadcasting in the San Francisco Bay Area. Before and After the Great Earthquake and Fire, 1897-1916 – Topics in this collection of twenty-six films include the 1906 earthquake, the Panama Pacific Exposition (1915), and a 1903 Chinese funeral. Internet Archive: Moving Image Archive – A collection of videos from the 20th century. Radio Broadcasting History, San Francisco – List of personnel from various local radio stations. San Francisco Bay Area Radio History – History of local radio broadcasting presented by Tangent Sunset. San Francisco Radio History – ‘Voices Out of the Fog’, a history of early radio broadcasting in the San Francisco Bay Area. Shaping San Francisco – Collection of videos presented by Shaping San Francisco and hosted by Internet Archive. FAS.org – History of the San Francisco Hunters Point Naval Shipyard. Fort Point National Historic Site – History of the Fort Point (from 1853) by the National Park Service. Fort Point was used by the U.S. Army. Globalsecurity.org – History of the Treasure Island Naval Air Station from 1941. Museum of the City of San Francisco – U.S. Navy Operations During the 1906 Earthquake and Fire. Presidio of San Francisco – History of the Presidio (from 1776) by the National Park Service. The Presidio was the site of Spanish, Mexican and American armies. San Francisco Maritime National Park Association – History and tour of the USS Pampanito (SS-383), a World War II Balao class Fleet submarine. US Coast Guard Air Station San Francisco – History Of Coast Guard Air Station San Francisco from 1903. Western Neighborhoods Project – Fort Miley/VA Medical Center history. World War II in the San Francisco Bay Area – Links of places in the National Register of Historic Places involved in World War II. Zpub.com – History of the San Francisco Hunters Point Naval Shipyard. Includes a timeline and historical photographs. California Historical Society – The headquarters, located in San Francisco, accommodates a research library, museum galleries, and a museum store. De Young Museum – History of the museum. De Young Museum – History of the de Young Museum. Golden Gate Railroad Museum – Concentrating on steam and passenger road equipment. Legion of Honor – History of the museum. Fort Mason Resident Organizations – Includes the Mexican Museum and the Long Now Museum. San Francisco Fire Department Museum– An organization for the preservation and restoration of fire apparatus and fire artifacts relating to the history of San Francisco. San Francisco Maritime National Historical Park – This unique National Park Service site located at the west end of Fisherman’s Wharf, includes the fleet of historic vessels at Hyde Street Pier, the Maritime Museum, and the Maritime Museum Library. Treasure Island Museum Association – On Treasure Island, exhibitis based on events that happened there, including the 1939 World’s Fair and the military. Virtual Museum of San Francisco – Gladys Hansen’s internet museum, with exhibits on the 1906 disaster, Gold Rush, and Golden Gate Bridge. Wells Fargo History Museum – On the site where Wells Fargo first opened for business in 1852, this museum features various historical exhibits. Alta Plaza – A history of the neighborhood by NoeHill. Eureka Valley – A history of the neighborhood by NoeHill. The Fillmore Museum – A virtual museum for the Fillmore district. Fillmore Street History – A history of the street by the Fillmore Merchants Association. The Fillmore Museum – Timeline of events on Fillmore Street. Hunter’s Point – History – A timeline and photos for Hunter’s Point. Neighborhood Parks Council – Histories of San Francisco parks, including: Alamo Square, Alta Plaza Park, Aquatic Park, Argonne Playground, Boeddeker Park, Brooks Park, Buena Vista Park, Crocker Amazon Playground, Dolores Park, Duboce Park & Harvey Milk Rec. Center, Edgehill Mountain, Glen Canyon Park, Helen Wills Playground, Holly Park, India Basin Park, Islais Creek, Jackson Playground, Junipero Serra Playground, Lafayette Square Park, McLaren Park, Mountain Lake Park, Palace of Fine Arts, Park Presidio, Pioneer Park, Precita Park, Randall Museum/Corona Heights, Rose Page Mini Park, South Park, South Park Revisited, Saint Mary’s Park, Stern Grove/Pine Lake Park, Sunnyside Conservatory, Sunset Recreation Center, Tank Hill, and, Woh Hei Yuen Recreation Center and Park. Russian Hill – A history of the neighborhood by NoeHill. Union Street – A brief history of the Union Street area in upper Pacific Heights. WebCastro: History and Culture – A collection of articles about the history and culture of the Castro district. Western Neighborhoods Project – Nonprofit organization formed to preserve and document the history and culture of the neighborhoods in western San Francisco. Mount St. Joseph – St. Elizabeth – Started in 1852 as an orphanage by the Daughters of Charity and now is residential treatment center for adolescents. How to research your San Francisco building – checklist compiled by Jean Kortum, Landmarks Preservation Advisory Board, 1993; hosted by San Francisco Public Library. San Francisco City Directories – Online databases and links to other websites with historical city directories. San Francisco Public Library– List of resources available in the History Center. Sanborn Fire Insurance Maps 1899/1900 – Collection of maps indicating information (such as buildings, streets, etc.) for fire insurance purposes. Library of Congress, Railroad Maps – Various maps of San Francisco Bay and California railroads from 1851 to 1883. Golden Gate Railroad Museum – A nonprofit organization dedicated to the preservation of steam and passenger railroad equipment, and the interpretation of local railroad history. Central Pacific Railroad Photographic History Museum – Many pictures, maps, and documentation for this railroad line. Public Schools – Historical article dated 1879. Includes short histories on most, if not all, schools of the era. Public Schools – Historical article dated 1858. Bay Area Sports Hall of Fame – Sponsored by the San Francisco Chamber of Commerce. San Francisco Giants History – History of the City’s current professional baseball team. San Francisco Seals – History of the San Francisco professional baseball team that played in the Pacific Coast League (PCL) from 1903 through 1957. San Francisco Streets Named for Pioneers – By the Virtual Museum of San Francisco. San Francisco Street Names – By John Casey. San Francisco Theaters, Cinemas, Dancehalls, after 1906 – A list with links to available photographs on the internet. African Americans in California Timeline – Timeline of African Americans in California. Chinatown History – Historical timeline for San Francisco Chinatown. Chinese in California Timeline – History of the Chinese in San Francisco. Golden Gate Bridge – Construction history of the Golden Gate Bridge. Levi Strauss & Co. History – The history of Levi Strauss & Co.
Presidio Timeline – Timeline of the Presidio’s history. San Francisco History – A Timeline – A general San Francisco timeline. San Francisco Timeline – History of San Francisco Queer Culture. San Francisco Timeline – 1776 to 1859 – A general San Francisco timeline. San Francisco City Guides – Free walking tours of the City by volunteers. – An extravagant show of colorful lights shot across building facades and danced in the sky above the exposition. Rejecting the standard practice of “outline lighting”, which traced the contours of buildings with rows of bulbs, Walter D’Arcy Ryan of the General Electric Company forever changed architectural illumination with his innovative scheme. The most spectacular effects came from the installation of forty-eight giant spotlights sitting atop a miniature Morro Castle on the waterfront. Called the Great Scintillator, it was manned by Marines who moved the spotlights to project changing colors and patterns on the canvas of fog that rolled in from the Golden Gate. When the weather failed to cooperate, tubes hidden in flagpoles pumped smoke and steam from a locomotive engine into the sky. Bursts of steam that shot through the beams mimicked fireworks during celebrations.Ryan also designed an electric kaleidoscope inside the glass dome of the Palace of Horticulture and lit the palaces, courts, and Joy Zone in novel ways. This synthesis of art and technology cost an estimated $52,000, about $1.23 million today. In Vacaville .. October 23rd – Skies filled with atmospheric geoengineering trails. Every day until November 8th. Nov. 8th, High winds.. .30mph in town but less in other surrounding counties. the Powers that Be will do what they will do. The best we can do is PREPARE. Aerial Images and video – Testimony is a bit ‘iffy’ and confusing. .. but videos and images are something to consider. Ben Shapiro is editor-in-chief of The Daily Wire and host of “The Ben Shapiro Show,” the top conservative podcast in the nation. Shapiro is the author of seven nonfiction books, including The New York Times bestseller Bullies: How the Left’s Culture of Fear and Intimidation Silences America (Simon & Schuster, 2012). Ben Shapiro presents on the current issues facing California and the future of the state. The guy in this video is a bit superficial about saving his cars than the workers, however, there are some interesting view of the fire. Take a peek at 9:24 and 10:04. Notice the fire line. Looks familiar, doesn’t it? These fire lines are DEW laser fire. If you’re not familiar with Non-Governmental Official agencies like ABAG and SCAG, they push the Agenda 21 initiatives under the guise of sustainability. Lost my house in this fire. It was ungodly hot, and fast. No warning, no ems message…just cries of “get out now!” being heard through the neighborhood. Oh and look up SB901. Oh and another thing, this fire was planned, just not the way it went down when or where. 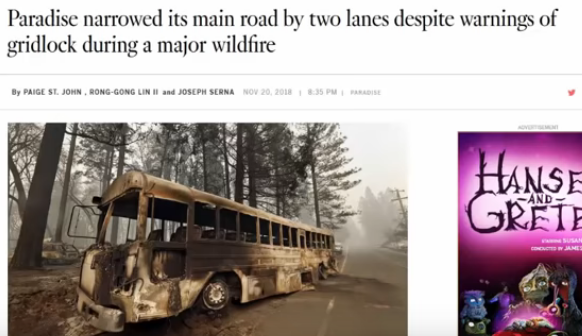 SB901 full of their NWO double speak as they call that thing: Wildfire Preparedness and Response. It should be called: “The Serf’s and debtslaves of California will pay the millions and millions of dollars for PG&E et.al to burn them up and off their own land bill.” —–> ” SB 901 also creates a process for electrical utilities to seek approval from the California Public Utilities Commission to recoup costs from ratepayers in addition to utility shareholders, for 2017 and future wildfires”. And may I just add, this wasn’t just Paradise that was lost. It was also the towns of Magalia, Gorda, and Concow. Live near there but didn’t move there because of traffic problem. One narrow high way in and one way out. Horrible tragedy. Betcha they only allow stack n pack compartment living back in there! They have gold there in the hills of the feather river. Hmmm? Those that lost their homes will probably not be allowed back in to rebuild .. this time. Watch. Wish the people of Cali would rise up against their local governments.. Guarantee you will have help.. People in EVRY State is sick of watching what’s happenning to Cali.. If they take Cali down. Believe you me.. Other States will be a breeze..Stand your Ground!!! Here in Columbia, S.C. they put in these stupid bike lanes and the citizen’s raised so much hell they did away with them. MORE MONEY WASTED. Chemtrails = nano barium = droughts! Chemtrails = nano particulates of aluminum oxide saturating the forest with accelerant = like saturating the forest with lighter fluid = more intense forest fires! Droughts + flammable materials = more intense forest fires! Our weather is being held hostage by Geo-engineers ie chemtrailers! Will Wel yea they say the same chemicals that are found in chemtrails are the same chemicals found in thermite. Was going to say, it burns like thermite! KingCoin 420 firefighters have already stated that these fires are like fires they have never seen before. Bigger, hotter and faster. I live in Penna, a small town. We got rid of a car lane and made it into a bike lane. It is 5 degree windchill today. The area is mostly elderly. Elderly are not going to bike errands when they have difficulty getting a shower. The population is aging… so more and more people are not going to be capable of brisk walking, or bike riding. San Diego has it all figured out they have built Stack and Packs beyond the imagination (I guess the younger generation doesn’t see the resemblance to the old failed tenement /projects of years ago?) because they now are called “apartment homes” anyways…back to what they have planned for us….as they crowd us together in apartment cells we are then suppose to rent their public scooters (yes like those you child plays on) or rent their public bicycles if we must leave our house, although I am not sure they want that now. Yes the sick, disabled and elderly will just have to join in their grand communist NWO UN Agenda 21 fun until the American people mobilize and take their country, communities and schools back from these sick Marxist fools. If there is in fact a trend towards people not wanting to drive as much as the woman in the video claims, it’s because the government is forcing them in that direction via rules, regulations, and taxations that make owning and operating a vehicle an increasingly difficult proposition. Rockefellers Built the United Nations. They have their dirty hands in everything. Schools, Pharmaceuticals, Depopulatons around the whole world. United We Stand What makes it more abominable is that the Rockefellers were “professing Christians” who didn’t practice TRUE Christianity! @Mike Andry Nobody can profess to be a Christian when they look to Depopulate the world as Rockefeller began to do many years ago when he traveled to India. That’s when Rockefeller’s Depopulation Plan first began. Murder as many people as you can for profit !!! I remember when they first built the skyway out as a four-lane highway between Paradise and Chico. Well, I remember my parents talking about it I should say. My grandfather worked for the Paradise Fire Department in the 60s and 70s. He said the Skyway was so important because it would give people a way to escape out of town. He was always warning that if Paradise ever caught on fire, the whole town would burn and thousands would die. Fire protection was always so important to the town. It was always discussed. To know that these communist bastards did this road narrowing to my hometown.. there are no words to describe my anger. When we were told to evacuate my ex had the car and was out of town. I have a 3 year old and a 4 year old daughter and they both require child safety seats.. Our house was located on Pentz road which at that time was a evacuation route that only takes about 12 minutes to get you down the mountain to safety. I stood on Pentz with my two daughters and attempted to hitch hike a ride and watched in horror and disbelief as cars refused to stop for 15 seconds and pick us up as they drove to safety. Most of the vehicles only had one driver and no occupants and plenty of room. Finally a woman was on my street checking on her friend saw what was happening and immediately picked us up but a minute before they closed down Pentz as an evacuation route. They instead re-routed us on a road which quickly turned out to be a death trap. Total suicide in a more dense forrest. The road was very narrow and the heart or eye of the fire was headed right at it stronger than ever. People were directed down Pearson road only to find it was a parking lot that wasn’t moving surrounded by fire and smoke so thick and dark you could not see the sun. It was like midnight with no moon or stars shining. People behind us blocked anyone from backing up.. People panicked and some got out of their cars and attempted to make a run for it. Many didn’t make it very far because of the high heat and smoke inhalation and their clothes were catching on fire. Those abandoned cars effectively blocked the road and people just 50 feet behind them had no idea and were sitting ducks. The woman that picked us up saved our lives. None of us should be here right now. We were totally engulfed in flames and both the woman and I were on our cell phones saying goodbye to people. It was about 150 degrees in the cab and my kids were screaming. I covered them with my jacket and knew it would be all over in less than a minute. By the grace of god the car in front of us moved forward about 30 feet and we quickly moved forward enough to get out of the fireball. I got out to make sure our truck was not on fire. On the left side I saw about a dozen bodies. Some holding their pets. The problem is my 4 year old daughter witnessed exactly what I saw. We are alive but my daughter is having some terrible nightmares. I have had a child psychologist keeping close tabs on her. When I get the time I will seek help myself. I have never experienced anything so horrible in my entire life. It has had a very profound effect on my life. Losing my home and everything I owned seems so minuscule. I am more than grateful we survived. There was no traffic control, cops, firemen or anything on that road. We were just herded into a huge ceramics kiln to fend for ourselves and most everyone there was not thinking straight at all. Just reacting to the heat, lack of air and their clothes catching on fire. I cannot speak for the rest of Paradise but I can say what I saw where I was at early that morning on Pearson road. I kept wondering where the huge air tankers were. I felt a moment of relief when I heard what sounded like a huge jet somewhere above us so I got out again to look and quickly discovered the sound I was hearing was the fire on steroids.